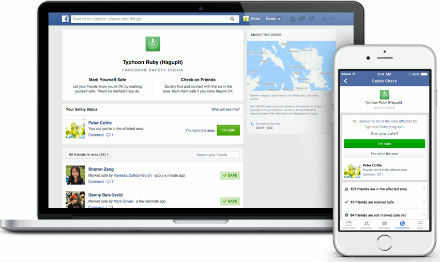 Use Facebook's Safety Check feature to make sure your family and friends are safe during a natural disaster. Whether you’re an everyday Facebook social networking fan or not, you will definitely appreciate Facebook’s Safety Check In Feature. The handy feature is helpful if you’re in the midst of a natural disaster, terror attack, or domestic mass shooting or similar crisis. In this post, we’ll explore the great value of this feature. First, let’s go a little further back in history. When the Loma Prieta Earthquake hit October 17, 1989, it shook the entire central coastal California region from San Francisco Bay to Monterey Bay and all the communities east of this area for many miles inland. With the third game of the World Series about to start, millions of people were already watching television when the news broke. The nation was horrified to see videos of freeways collapsing and buildings crumbling, many with people inside, played repeatedly. Immediately, people started trying to get in touch with their family and friends who lived in the region, but unfortunately, the phone lines went down and many stayed down for days, as did the electricity. It was heartbreaking not to know if your loved ones were safe or not. It was equally frustrating if you were in the region and couldn’t get word back to those you knew would be worried sick about you until they knew you were safe and sound. Amid all of the chaos, this was the top priority for most people but there was just nothing they could do. Normal lines of communication were GONE! Of course, at the time there was no Facebook, and no other social media for that matter. Cell phones had been invented but very few people had them so there was really no such thing as “text messaging”. Rudimentary forms of email were only used by academics, emergency personnel, government officials, and science nerds — and even among these groups, the usage was limited. Plus, it just wasn’t safe to travel the roads to check on people who weren’t in the immediate vicinity, especially with several large aftershocks causing even more damage and injecting even more fear and uncertainty into the population. Bottom line, if you lived through that event or had family or friends who lived there who you couldn’t get in touch with, those were some LONG tortuous hours and days having to wait to know if everyone was okay. Fast forward to March 11, 2011 and the magnitude 9.0 Tōhoku earthquake hit forty-three miles off the coast of Japan, followed by mega tsunami waves and the Fukushima Daiichi Nuclear Power Plant disaster. More than 15,000 people died and hundreds of thousands of buildings either collapsed or were not safe to occupy. As a result, more than 400,000 people were displaced and evacuated. Both cell phones and landlines were down. However, even with the main trans-Pacific cable severed, basic internet was restored in some areas. During this chaotic time, Facebook became one of the most important ways that friends and families checked on each other and communicated. Basically, Facebook became an invaluable lifeline to those families who were completely devastated by a whammy of three related mega catastrophes. The social network’s engineers took note of this and were initially inspired to create a disaster related discussion board. This then then burgeoned into Facebook’s Safety Check tool which they announced in October of 2014. The goal of this tool was to make it easier and quicker to communicate whether or not you are safe during a disaster and to facilitate communicate with your family and friends listed on Facebook. When a mega crisis occurs, Facebook activates the tool across the entire social network. The program then searches for everyone who may be affected by looking at the city people have listed in their profile, the location of their last check in, and the city from which people most recently accessed their account. Those who may be affected receive a notification from Face book asking if you are affected and if they are safe. Once they respond to this inquiry, an update is automatically sent to all their friends and family on Facebook. The first time Facebook’s Safety Check In Feature was officially used was on April 25, 2015 during the Nepal Earthquake. It was used again shortly afterward during one of the major aftershocks of this terrible earthquake. It was used again in October 2015 when Hurricane Patricia hit the western side of Mexico. Another type of natural disaster during which Safety Check was activated was during the South Indian floods that took place in late 2015. The first non-natural crisis during which Safety Check was activated was the terror attacks November 2015 in Paris, France. Recently, in March 2016, Safety Check was activated for the explosions that took place at the Brussels airport and train station. The check in feature was used a total of eight times in the period between October 2014 and November 2015. We know this because each of these activations was officially announced. However, since the tool was activated in the Boko Haram bombings in Nigeria, Mark Zuckerberg announced he would not be listing each activation of the tool since there are, unfortunately, so many of these types of incidents in the world. Still, any time this tool is activated, it is usually reported at least in the regional news since it is so helpful to connecting friends and family. There are a few recent important updates to Facebook’s Safety Check In Feature that will make it even better in the future. First, they have redesigned the activation procedure so that several more employees beyond the elite engineers are now able to activate it. This was in response to the fact they missed activating Safety Check during a major bombing incident in Beirut. Second, the development team has added eighty languages to the tool so it can be deployed in more areas around the world, even reaching third world countries and developing nations. The company is beginning to test a new feature where anyone can launch Safety Check once a certain threshold is reached for people talking about about a particular crisis and it is verified by trusted third parties. Once the bugs are worked out of the beta tests, this will allow the Safety Check tool to be used in many more crises and in more localized crisis situations. The feature was activated for the first time in the United States during the mass shooting at the Pulse night club in Orlando, Florida early Sunday morning on June 12, 2016. If you have any questions about Facebook’s Safety Check In Feature, please leave a comment below. Also, learn about other Private Investigator Software Apps.